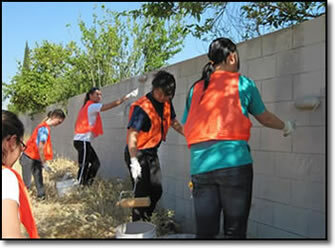 The Public Education Program for graffiti was developed by the City of Riverside in partnership with Keep Riverside Clean and Beautiful. The purpose is to bring together concerned citizens, local business, law enforcements, government agencies and school districts to inform them on the economic impact of graffiti and involve them in positive action. The goal is to instill sense of respect for public and private property among our youth and develop a program that will educate them about the negative impact of graffiti. All concerned citizens are welcome. Join Keep Riverside Clean and Beautiful in fighting graffiti by attending PEP (Public Education Program) for Graffiti meetings. The difference between graffiti and art is permission. Graffiti vandals use paint, markers, or chemicals to scratch monikers or elaborate designs into property such as fences, walls, buildings, train cars, bridges, desks, etc., without the owners permission. The majority of graffiti is done by vandals known as “taggers”. They are motivated by the need to be recognized. They believe that the more they vandalize public areas, the more respect they will receive from other graffiti vandals. Many taggers also think participating in other illegal activities such as shoplifting materials and trespassing adds to their status. Once graffiti is present in an area, it invites other vandals to do likewise in the same area or nearby. Thus, graffiti can begin a downward spiral if not removed immediately. Graffiti that is not promptly removed sends a message that nobody cares, attracting other forms of crime to the neighborhood. Graffiti drains tax dollars. Funds that otherwise could be used for school programs, recreational facilities, and other community improvements are used for graffiti removal programs in an effort to maintain the city and reduce crime. Residents feel less safe and secure in an area where graffiti is present. Neighborhoods with graffiti experience a decline in property values, loss of business, reduction in tourism, and reduced riders on public transit systems. Education: Develop an educational component and incorporate graffiti education and prevention in school, businesses, and community groups. Eradication: The most effective way to prevent future graffiti is prompt removal. While this may be challenging, studies show that removal within 24-48 hours results in a nearly zero rate of reoccurrence. (951) 826-5311 from a cell phone. 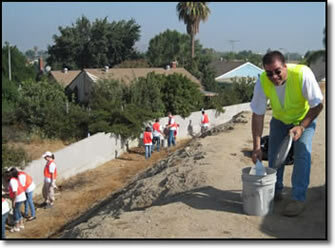 Public Works Graffiti Coordinator, Bob Rivers leads a team of volunteers on a paint out in Ward 5. Volunteers match the paint to uniform a wall in a residential neighborhood in Ward 4. Volunteers from the Key Club at North High School coordinate a service project in Ward 7. With all that Riverside is doing to prevent graffiti, you may be wondering, “What can I do?” The answer is REPORT, REPORT, and REPORT. 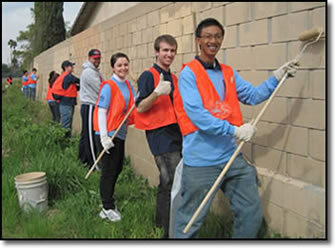 Dial 3-1-1 from a Riverside home phone or (951) 826-5311 from cell phones to report graffiti. If you are witnessing graffiti crime in progress calls 9-1-1. For more information about graffiti and how it hurts our community please visit www.graffitihurts.org.